United Way and the Measure of America joined forces in 2008 because both organizations focus on the building blocks of a good life - a quality education that starts from birth and ultimately leads to a stable job, enough income to support a family through retirement, good health, and the ability to achieve one's full potential. Out of this partnership came the Common Good Forecaster™, a tool that shows how vital economic and social issues in your community might change if educational outcomes were better. Disclaimer:This is a forecasting application that uses statistical models drawn from peer-reviewed studies to predict the effect increased levels of educational attainment are likely to have on other important variables. For the vast majority of indicators included, we start from official federal data for particular locations broken out by education level. When adjustments are made in the “mix” of educational attainment, we are assuming that current relationships between education and all other factors in a given geographic area remain the same. Extreme adjustments to the sliders can produce unrealistic results in other factors (ie. unemployment, poverty, and murder rates falling to zero). 1. Choose the geographic unit (county, state or nation) you want to explore. at least a four-year college degree. You can also view the U.S. and state average for your community. 3. Explore changes in the selected economic or social indicators below the sliders. This takes all adults 25 and older who have less than a high school education and "graduates" them from high school. So, if you were looking at the US educational "mix" for example: 16%/30%/27%/27%. After choosing this scenario, the sliders would move to: 0%/46%/27%/27%. The "educator's dream" scenario takes all adults 25 and older and has them graduate to the next higher of the four defined categories of education. So, back to the US "mix": 16%/30%/27%/27%. After selecting this scenario, the sliders would move to: 0%/16%/30%/54%. Note: This Forecaster is based on either observed data or peer-reviewed statistical models to forecast what changes might occur in other variables if increased levels of educational attainment are realized. For the majority of indicators included, the data are broken out by the education levels in these local areas. When adjustments are made in the "mix" of educational attainment, we are assuming that current relationships between education and all other factors in a given geographic area remain the same. Extreme adjustments to the sliders can produce unrealistic results in other factors (i.e. unemployment, poverty, and murder rates falling to zero). What do the levels of education correspond to? The Common Good Forecaster uses two different types of calculations. Method 1 is used for every indicator except life expectancy and incarceration, for which we use Method 2. METHOD 1: We forecast the effect that changes in educational attainment will have on various social and economic outcomes based on the specific, current relationship that exists in each state and county between multiple variables. In county A, for instance, there may be greater economic returns to earning a college degree than in county B; this method takes that variation into account when predicting how changes in educational attainment might affect poverty or earnings for residents of those counties. (Bachelor’s degree or more x median earnings for this group) = today’s median personal earnings. This is based on estimates from reputable sources (e.g. Census Bureau, National Center for Health Statistics) for each community. All the countless external factors that affect the relationship between education and income, such as racial/ethnic profile, the community’s current economic scenario, industry health and mix, distance from commercial centers, geographic location, etc, are thus taken into account. Each community has its own unique relationship. METHOD 2: We start with data from large surveys or administrative records (like birth and death certificates). We use peer-reviewed research to establish a nationally representative relationship between the indicator in question and the educational attainment level. This method (applied to life expectancy and the incarceration rate) differs from Method 1 in that these results are education-to-indicator relationships at the national level applied to every local geography where data are available. The assumption made here is that the national education-to-indicator relationship is valid for all constituent geographies. For illustrative and forecasting purposes, we find this an acceptable assumption. Please note that due to the statistical instability of available data for areas with very small populations, counties with fewer than 10,000 residents could not be included in the Forecaster. The remaining 1,731 counties and county equivalents are home to 97.4 percent of the nation’s population however. Many factors affect outcomes in such areas as children's reading proficiency, obesity, income, poverty, and incarceration. Why pull out education and focus on this alone? The Forecaster is an effort to disentangle the effect of education on various important indicators of personal and community well-being from the effects of other factors on those same indicators. 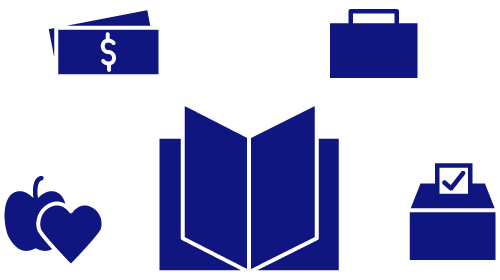 For example, social scientists use the concept of socioeconomic status to describe the social and economic composition of an individual or family in relation to others in society; this status is based on a combination of factors, among them educational attainment and related prestige, income level, and occupation and associated status, and the resulting power and access to and control over resources that this status affords. Nevertheless, in practice, social scientists use what they can as a proxy for this broader concept. Can one ever separate entirely the effects of income and education? Often not meaningfully. Aren't you oversimplifying the relationship between education and other factors in a community? Yes and no. Scientists do this all the time by necessity. Might there be intermediate factors that are more important in affecting the indicators in this Forecaster? It's possible, but in terms of powerful underlying causes, not many match the breadth of impact that education has on people, their communities and their larger societies. And yes, by saying the relationship between education and these other factors is one-way only is not always accurate. For example, research shows that obesity can lead to social stigmatization and mental health issues, preventing some high school seniors from pursuing further education. By also answering no to this question, we mean to say that in the case of one of our methods (see above for a discussion of both methods), we are actually being as rigorous as possible in honoring the differences of local places. We take local county estimates and reweight existing relationships determined by the many unique factors in that community. This method is rooted in the uniqueness of place. For some indicators, there is no county data available at all. Why? Some indicators are not available at all at the county level. Furthermore, data for counties with fewer than 10,000 residents could not be presented due to statistical instability. For incarceration, data are only available by state because many counties do not have prisons and because inmates are rarely imprisoned in their own communities. What are my options if I live in a county for which there are no data? One option is to select neighboring counties that seem similar to yours. Sometimes major shifts in education produce only limited changes in other indicators. Why? Each state or county has a countless array of factors affecting key social and economic indicators. (i.e. the community's current economic scenario, industry health and mix, distance from commercial centers). There are different ranges of what is possible county-by-county and state-by-state, depending on these factors. In some counties, the difference between the maximum and the minimum values may seem small compared with ranges within other counties because the returns to education may be greater in some places than in others. If no sliders are moved what am I seeing? You are seeing the current situation in that place based on the most recent data available. U.S. Census Bureau, American Community Survey, 2012-2016. Measure of America and Institute for Health Metrics and Evaluation calculations, 2010-2014. Centers for Disease Control and Prevention, National Center for Health Statistics, VitalStats Online, 2013-2015. Centers for Disease Control and Prevention, National Center for Health Statistics, Underlying Cause of Death File, 2011-2016. Centers for Disease Control and Prevention, 2016 Behavior Risk Factor Surveillance System. U.S. Department of Education, 2015 National Assessment of Educational Progress Reading Test, Eighth-Grade Reading Proficiency. Atlas of U.S. Presidential Elections, 2016. U.S. Department of Justice, Bureau of Justice Statistics, 2016. Data used in the Common Good Forecaster are available here. EXPLORE HOW EDUCATION AFFECTS US ALL. Education benefits all of us. More education leads to better jobs and high incomes. But education is about more than jobs and wages. United Way and the Measure of America have created a tool to forecast how things might change in your community if educational outcomes were better. Or choose another place in the U.S.